PHOTO BY PAT GAIETTO Bellevue’s Casey Santoro drives past Columbian’s Nakyia Jones Saturday in the Division II sectional final in Bucyrus. BUCYRUS – There are some teams you just can’t beat. They have your number. That’s the feeling for Columbian recently when it’s matched up against Bellevue, which knocked out the Tornadoes in a Division II district quarterfinal for a second-straight season with a 70-29 victory Saturday. Bellevue’s pressure, whether it was in the full court with its unrelenting press, or in the halfcourt with its pressure man-to-man, swallowed up Columbian. In the end Columbian had 34 turnovers, including 19 in the first half. 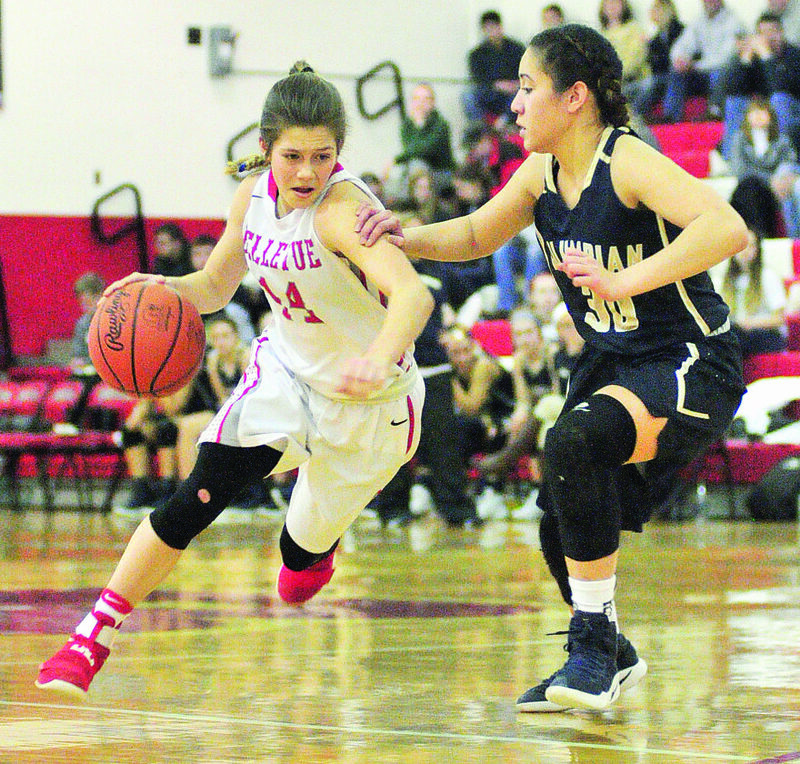 It didn’t stop in the second half as TC turned the ball over 12 times in the third quarter, which spearheaded a 26-0 period for the Lady Red, who led 58-14 by the end of the three quarters. “I thought we played decent in the first half, but I thought at times we were a little stagnant on the defensive side of the ball,” Bellevue coach Kory Santoro said. “We challenged them at the beginning of the third quarter to come out and see them play better defense and I think you saw that, as we held them to zero points. I think our defense then picked up our offense a little bit then. The Bellevue defense made it tough for Columbian to get into its offense and it really slowed down Madalyn Brisendine, who ended with just four points for TC. On the other hand, it was pick your poison for the Columbian defense, as 10 Lady Red players scored in the game, including freshman Casey Santoro, who led everyone with 19 points, while Payton Vogel added 14 and Lauren Turner and Liv Baptista each had eight points. “We couldn’t play defense like we normally do because they just have too many threats out there, so we went with a 3-2 (zone) and I told the girls they needed to be quicker to shooters,” TC coach Erin Reed said. “The last time we played them they started 9 of 9 for the game, so tonight I think that went better as they missed some shots and we were effective even though that really isn’t our best defense. And then I just think we ran out of gas. Bellevue started its dominance from the tip as it ran out to a 14-2 lead. The Lady Red led 18-8 after the opening frame as Santoro recorded eight points. Columbian stuck with Bellevue in the early part of the second period, trailing 22-14 after a Beth Roof layup with 4:42 remaining, but Bellevue decided to pull away, ending the half with a 10-0 run. Then the third quarter came, which was all Lady Red, as Santoro dropped in 10 points in the period. “They missed some shots in the first half, but I think we played better defense in the first half, too. We were moving around quicker,” Reed said. “But in the second half, they started making a lot of their shots that they weren’t in the first. With the win, Bellevue will play Ontario, who beat Mansfield Senior 61-37, at 6:15 p.m. Thursday at Willard. For Columbian, it will lose six seniors, but it will bring back some talent for next season as the Tornadoes step into the Sandusky Bay Conference. “Seniors are a great group of girls and this being my 14th year as a head coach, second at Tiffin, but to have six seniors stick with it, you don’t see that too much,” Reed said. “That says a lot about them, because obviously all of them aren’t going to get that much playing time. I was just joking with them that I haven’t had a break from the since May, which is when we do all our fundraisers and stuff, but they were a main reason I wanted to come back is those six girls.